Lipopolysaccharides (LPS) are major constituents of the cell walls of gram-negative bacteria and they act as endotoxins to elicit strong immune responses causing hypotension, organ failure, disseminated intravascular coagulation, and fatal shock in mammalian hosts. The removal of these endotoxins is necessary for downstream applications, such as in vivo studies, protein vaccine development and immuno-cell based assays. GenScript's Endotoxin Removal Service can effectively reduce the endotoxin level below 10 EU/mg during recombinant protein production with a success rate of 98%. We have successfully delivered >500 low-endotoxin protein production projects that meet our clients’ strict endotoxin control requirements. 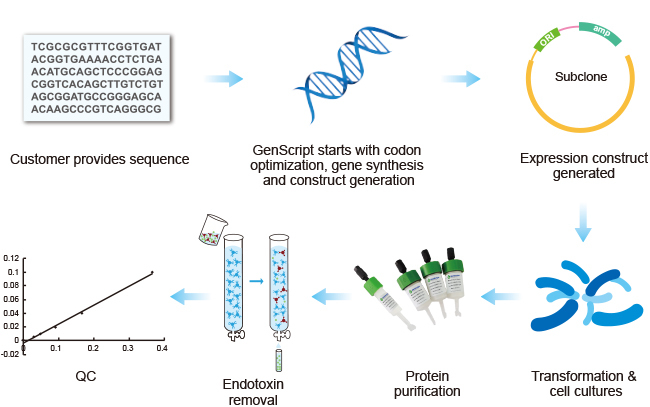 GenScript offers one-stop low-endotoxin protein production solution including protein expression and purification and endotoxin removal. Endotoxin control and removal starts from the instruments and reagents, stays with the all manipulation and it is finally achieved by multiple endotoxin removal techniques. GenScipt has a panel of approaches for endotoxin removal. After project evaluation, we develop customized endotoxin removal protocol for your target protein by using one method or combination of several methods to assure highest efficiency. Endotoxin is measured in EU/mL or EU/mg. 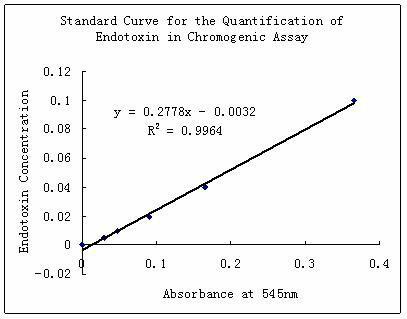 One EU (Endotoxin Unit) equals approximately 0.1 to 0.2 ng endotoxin/mL of solution. The commonly used FDA-approved techniques for endotoxin detection are Limulus Amoebocyte Lysate (LAL) assay. Currently there are three forms of the LAL assay, each with different sensitivities. The LAL gel clot assay can detect down to 0.03 EU/mL while the LAL kinetic turbidimetric and chromogenic assays can detect down to 0.01 EU/mL. Stable cell line development Custom stable cell lines for assay development, recombinant protein and monoclonal antibody production. We also provide comprehensive assay-ready cell line productions to preserve your time for higher value projects. ToxinSensor™ kits from GenScript are ideally suited for wide-spread use in endotoxin detection, and present a stable, highly-sensitive, and low-cost method in LPS detection.